Designer Kristen Rivoli blends opposing styles to perfection in a cutting-edge contemporary home. Wall of stacked limestone b blocks cuts through this Belmont home, which is clad in horizontal wood slats. The homeowners, who purchased the land more than 20 years ago, had always planned to build a home here that would take advantage of the Boston views. They lived in a traditional Federal-style brick home, but deep down, the husband was a modernist. 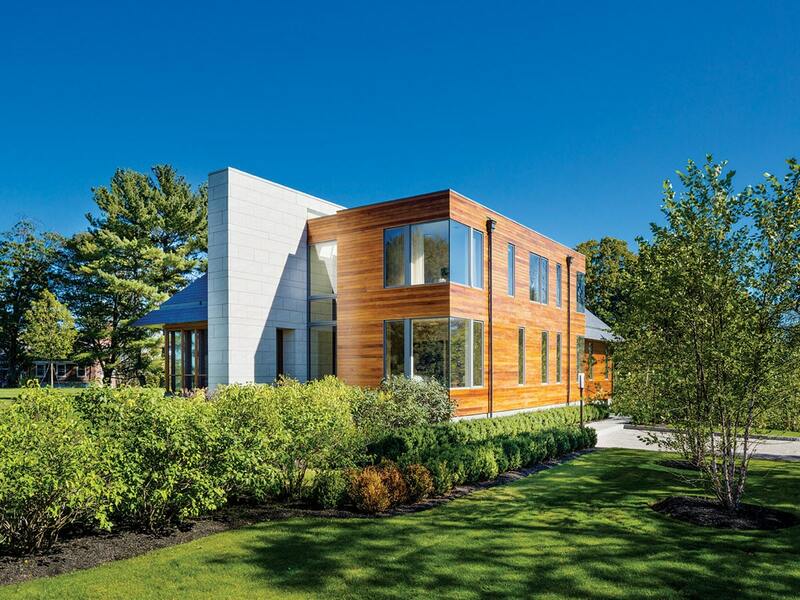 “It’s my dream come true to build this home in the contemporary style I love,” he says. Wood plays a large role in the design inside and out as the warming element of the materials palette, which also includes a fair amount of glass. The dening architectural feature is a limestone wall that slices through the house. It provides a unique backdrop for many of the rooms, in which Rivoli awlessly intermingles furnishings that span styles and eras. Ann Sacks Davlin tiles, created with gold leaf fused between two pieces of handcrafted glass, line the kitchen backsplash. In the double-story entry, angled fritted glass panels with mahogany handrails frame the airy statement staircase with its oak treads that lead to the glass-floored hallway above. Slate floor tile and a still life by local artist Anne Harney lend an earthy feel, while a custom Ochre light installation with 113 cascading handcast bronze and glass buds adds sparkle. On the other side of the limestone wall, the public space stretches the length of the house. 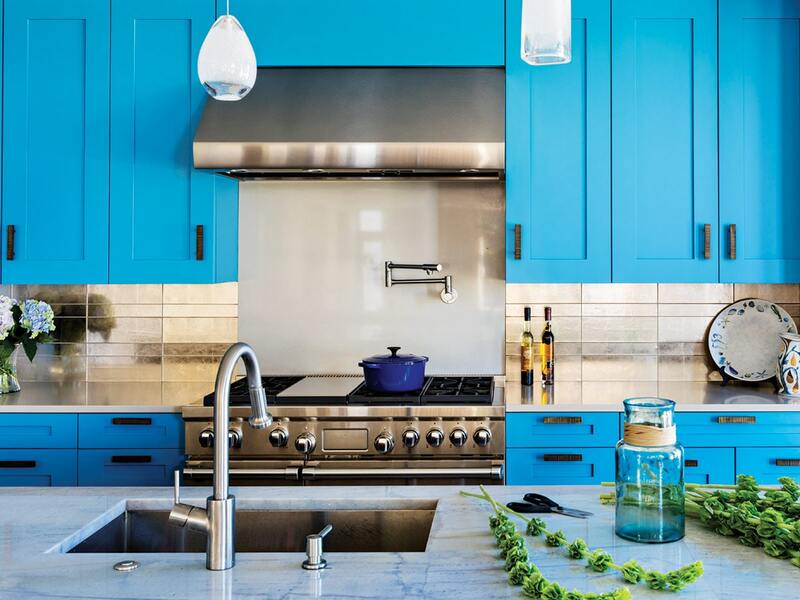 The kitchen, a surprising Aegean-blue gem with handpainted Moroccan-style floor tiles, anchors the back of the space, which is elevated. One can look from the kitchen over the dining and living areas right through the floor-to-ceiling windows to Boston. The narrow dining area is three steps down, nestled between custom cabinetry made from walnut sporting golden flames and tted with live-edge tops. An industrialstyle dining table custom made from a marble slab perched on a metal base is surrounded by midcentury-modern Tulip chairs designed by Pierre Paulin from M2L. A pair of gold-ecked Murano glass chandeliers from Chimera hang like jewels above, completing the eclectic and harmonious tableau. It’s another three steps down to the living room. A subtly patterned Stark rug anchors the Flexform sectional with woven leather back and two curvy De Padova chairs in leather and tweed, all from Showroom. The arrangement is casual enough for watching TV (a flat-screen hangs above the replace on the adjacent limestone wall), but dressed up enough for entertaining. The master suite is an elegant retreat, especially when the couple’s children are home from college. A custom bed upholstered in shirred polished cotton sits against a handpainted de Gournay silk wallcovering. It’s a moment of femininity that counters the adjacent limestone and floor-toceiling glass. Sleek oak and bronze nightstands by Holly Hunt from Webster & Company in the Boston Design Center ank the bed, rectifying the balance of hard versus soft and contemporary versus traditional that Rivoli strikes throughout. “I revel in the unexpected,” Rivoli says. That pretty much sums up her approach to design, most certainly in this house.